Scientists have found a shockingly hot, massive, Jupiter-like planet that has a tail like a comet. "It is so hot that it is hotter than most stars that we know of out there," says Scott Gaudi of Ohio State University in Columbus, Ohio, whose team describes the scorching world called KELT-9b in the journal Nature. The planet, which is around three times more massive than Jupiter, orbits a blue star about 650 light-years away from Earth. This star is nearly twice as hot as our own sun, and this planet whips around it once every one and a half Earth days. One side of the planet is locked in perpetual night. The other side always faces the searing heat of its host star and has a surface temperature of around 7,820 degrees Fahrenheit. "It's so hot that we think that there's no molecules that can live on the day side of this planet," Gaudi says. "Its day side would be very bright orange. Its night side would be very dark red. And it would have a cloud of evaporating hydrogen and helium, which would actually look violet." The gas giant's atmosphere is probably evaporating at a high rate, maybe even fast enough that it would all get blasted away before the star dies. All that would remain is a rocky, barren core — if the planet has one. "For a long time, we went back and forth about whether or not this planet could possibly be real. In fact, I had a bet with my graduate student over a very nice bottle of single malt scotch," Gaudi says. "Just for the record, I won." In recent years, scientists have focused on finding small planets around small, cool stars, such as Proxima Centauri. That's because, with today's technology, it's much easier to study the atmospheres of planets around those stars to look for hallmarks of a potentially habitable world. But as a result, scientists haven't spent much time looking for planets around bigger, hotter stars. What's more, these stars have certain characteristics that make finding their planets especially challenging. So even though researchers have detected thousands of planets orbiting other stars, they know of only a half-dozen that orbit hot, A-type stars, and none has been found orbiting even hotter B-type stars. This new planet's star is just on the dividing line between those two types. "It is certainly exciting to have spotted another rare system of A-type star plus planet. The A stars are the brightest stars in the sky, and likely most of the stars you know by name: Sirius, Vega, Altair, etc.," says Marc Kuchner, an astrophysicist at NASA Goddard Space Flight Center. "Since A stars are so bright and yet still common, we tend to know a lot about them — their sizes and shapes and what they look like when they are young. So it's been frustrating not to have many planets known around such stars to study." Our own sun is a G-type star, which is pretty middle-of-the-road in terms of temperature. If you go outside at night and just look up, "the majority of the stars you can see are more luminous, or hotter, than the sun," Gaudi says. While this new planet was detected with a relatively inexpensive telescope built using off-the-shelf technology, the team hopes to do follow-up studies using space telescopes such as Hubble and Spitzer. That way, "we can really study a planet under the most extreme conditions, basically, that we've seen any kind of giant planet experience," Gaudi says. Jonathan Fortney at the University of California, Santa Cruz, says he thinks the most interesting question is how warm the planet's permanent night side might be. "What kinds of winds might operate to bring absorbed stellar energy to the night side?" Fortney wonders. "Understanding that could only come from viewing the thermal infrared radiation from the planet over the course of a whole orbit. That could certainly be done with the Spitzer Space Telescope." 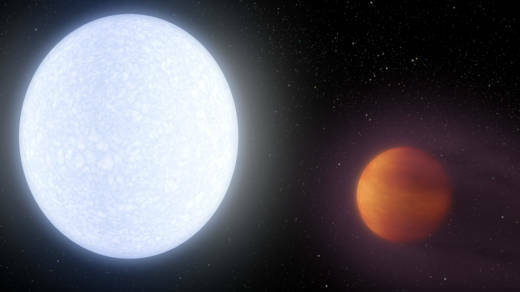 He notes that KELT-9b's surface temperature is so unusual that he wasn't able to analyze it using his regular computer simulation of hot Jupiter-sized planets. "In my database of the absorption coefficients of molecules and atoms, I never expected we would go beyond 3000 Kelvin," Fortney says, "and here we are at 4000+ Kelvin!"